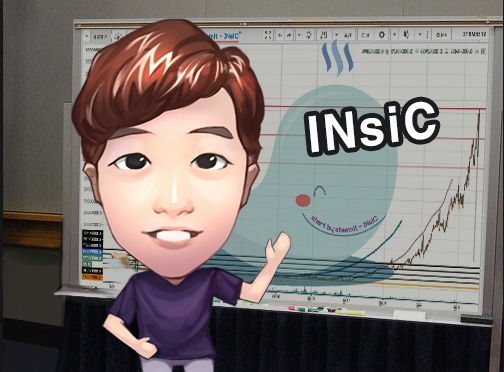 [ INsiC ] 06/20 Xrp/btc chart analysis , 분석 . #8steemCreated with Sketch. Hi, this is Insic again. 오늘은 xrp 분석을 한번 해보려합니다. 제가 알기로는 굉장히 물려계신분들이 많은걸로 알고있는데.. 한번 보도록 하겠습니다. 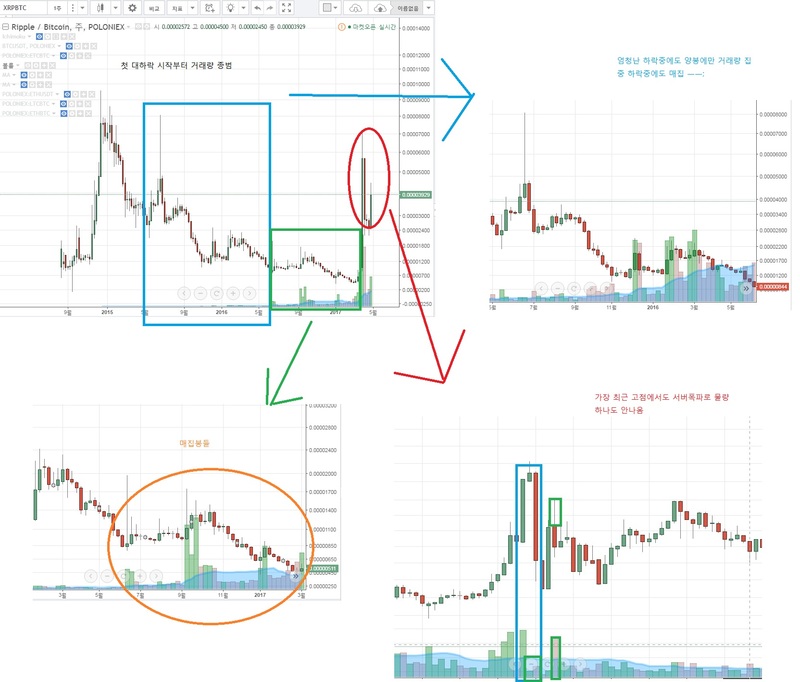 This time, I would like to analyze xrp chart. I have heard many people have made loss with xrp… but we will see what have happened. 샷 내용에 대략적인 현황들이 써있는데요 . 현재 차트상의 모습은 매우 좋다고 할 수 있습니다. 다만 .. 제가 카카오톡 방에서 활동을 하며 계속적으로 리플에 대해 부정적 언급을 많이 하는데요. 이는 리플이라는 코인 자체의 기술력과 관계없이 , 리플종목을 움직이는 세력이 굉장히 부도덕(?) 적이라 생각하여 지속적으로 말씀을 드렸었습니다. Even though price going down, but it was hold up upon 1year moving avg line. As you can see, chart itself tells us it is very good timing to buy, but as we all know, our target is xrp. Xrp usually doesn’t follow typical chart rules by invisible forces so I always warn people not to believe xrp too much. According to current chart itself, however, I have high expectation that xrp will rise rapidly. I just want to remind you are buying xrp again. 현재상태의 차트만 보고 판단했을때는 매우 높은 확률로 상승에 대한 기대를 해볼수 있는데요. 한번 리플의 과거 행적들을 살펴보도록 하겠습니다. Let’s see previous trail of xrp. 대략 2달되었으려나요 ..? 꽤나 이전에 만들어둔 리플 샷입니다. 보시면 , 리플은 과거부터 고점에서 물량을 팔아서 가격을 낮춘적이 없다는 부분이 매우 인상적인데요 . 저샷을만든 이후에도 , 계속해서 고점에서 어김없이 서버폭파가 나타납니다. 참 이상하죠 ?? I actually created this chart about 2 months ago. 해당샷은 4/3일경 리플이 큰 시세를 내었다가 , 최초로 서버폭파가 (제가아는) 되면서 대부분 투자자가 판매를 못했던 날 차트입니다. 15분 봉이며 , 서버폭파가 되면서 그누구도 판매를 못했을뿐만 아니라 .. 차트를 자세히 보시면 교묘하게 일봉 을 맞추어 덤핑을 하는 모습 확인할수 있습니다. 그 덕분에 , 지나고 나서 그때 당시에 차트를 위의샷처럼 15분봉이 아닌 , 4시간 혹은 1일 단위로 크게보면 별문제가 없어 보이는것이지요 . This chart shows when xrp hit the top, but many investors couldn’t sell their xrp due to Poloniex server malfunction. This is 15 min candle chart, and interestingly they dumped their xrp just by the lowest price the day when no others can sell the xrp due to server malfunction. As a result, it seems no problem on 4 hours or 1 day candle chart. 과거 라이트코인의 큰 움직임 이후에 , 리플 스텔라 종목군이 함께 따라움직였던 과거모습을 확인할수 있습니다. 그렇다고 하여 이번에도 꼭 그렇다는 보장은 없습니다만 .. 눈여겨 볼만한 시점입니다. Last chart is LTC/btc (red line) overlap chart to XRP/btc. As you can see, xrp/stella have followed LTC trends previously. However, no one know it will happen again. 종합 : 단일 종목군(xrp)차트상으로도 자리가 만들어져 있을뿐 아니라 , 과거부터 근래까지 라이트코인이 선행해주었던 부분을 생각하면 기대치가 매우 높은 상황입니다. 다만 우리는 리플이라는 녀석이 .. 과거부터 매번 투자자들의 뒤통수를 쳤던점을 기억해 경각심을 가져야 합니다. Conclusion: xrp chart itself tells strong signal to shoot, and LTC had a shooting right recently which cause high expectation of xrp shooting. However, we always keep in mind you are dealing with xrp… which has always betrayed your expectation. -저의 차트공개는 여러분의 차트상의 이해를 돕기 위한 도구이지 , 직접적인 시세의 방향을 말하지는 않습니다. 판단하시는데 하나의 근거로 사용하시되 , 그때그때 변화하는 차트의 흐름을 매순간 제가 봐드릴수는 없으니 참고용으로만 사용하시기 바랍니다. This is just a tool to understand how you can see chart, but I never tell how it will move. You can use this chart analysis as a different point of view for the chart, but have to keep in mind all investor has to take their own responsible. P.S. @noton84 helps translate my Korean version post to share the idea with all steemit community in English. You can follow him at @noton84. ㅎㅎ 맞습니다.. 이번에는 꼭 좋은결과가 있길 기대해봅니다!! 땡글에서 리플거래비중이 제일 높은 나라가 한국이라 하더군요. 점유율은 60%가 넘구요. ㅎㅎ 리스팀 감사합니다. 아무래도 드라마틱한 상승률이 큰 한몫을 한듯해요. ㅜㅜ.. 유일하게 리플만이.. 폴로닉스에서도 터진다는.. 흑흑..
맞습니다..리플에 물려계신분들이 참 많은듯합니다.. 워낙 드라마틱하게 크게 올랐던 녀석이라..
이번엔 조금 다른 모습 보여주길 기대해 봐야겠습니다. 네 저도 많은 분들이 리플에서 좀 자유로워 지셨으면 좋겠네요. 인식님의 차트분석은 늘 깨달음을 주지요 ☺감사합니다! 좋은 분석글 감사합니다. 리또속이 안되길 바랍니다. 네.. 얼마나 많은분들이 당하셨는지.. 오죽하면 리또속 ...이라는 유행어가 ㅠ_ㅠ..
월급들어오고 나서 올랐어야 하는데 ㅠㅠ 슬픕니다. 비록 저는 리플을 타다 내려온 상황이지만 같이 투자를 하였던 동료는 리플에 묶인 상황이라 인식님의 글 꼭 전달해 주려고 합니다. 주변 동료분들이.. 꼭 이번기회에 리플에서 수익 보시길 기도합니다..!! 헉..!! 감사합니다 좋은결과가 있길 바랍니다.. !! 코인판은 차트가 의미가 있나 싶네요. ㅎㅎ 이번엔 좀 다르길 기도합니다..
이번에 크게 상승해주길 기도합니다 ! 항상 좋은 분석글 감사합니다! 인식님의 분석력 덕분에 많은 것을 배워갑니다! 감사합니다! 도움이 되신다면 다행입니다.. !! ㅎㅎ 유행가 처럼 퍼지더군요.. "리또속 리또속 또속는구나~ ... " 하며 ㅎㅎ 이번엔 잘가주길..
우와 리플에 대한 분석과 의견 흥미롭게 잘 읽었습니다. 그보다 제 첫포스팅에 방문해주신것도 감사합니다. voted&resteem!!! 감사합니다... insic님 덕분에 꿀빨고 있습니다.. 너무 만족스럽습니다. 아....리플...애증에 리플..ㅠ 이번에 리또속이아니길 빌어야겠네요 ㅠㅠ 포스팅감사합니당!! 보팅후 후다닥! 감사합니다~! 이번엔 꼭 잘가주길 바랍니다! !! 감사합니다 ! 열심히 활동하겠습니다. This post has been ranked within the top 25 most undervalued posts in the second half of Jun 20. We estimate that this post is undervalued by $144.53 as compared to a scenario in which every voter had an equal say. See the full rankings and details in The Daily Tribune: Jun 20 - Part II. You can also read about some of our methodology, data analysis and technical details in our initial post.